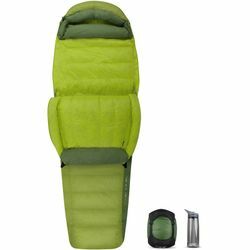 Sea to Summit Ascent AcII 15 Sleeping Bag. The Ascent™ down sleeping bag redefines what versatile means in a sleep system. Complex construction and high-quality down keep you warm when it’s cold outside, while the triple-zipper Free-Flow Zip™ system ensures you stay cool and ventilated when the weather warms.